This review contains a lot of spoilers; so be prepared. I never was into Super Heroes when I was a child. Normally, I was into Princess’ and Disney. You can imagine that I was into Prince’s rescuing the damsels in distress and setting off into the sunset, living happily ever after. Then, there came the backdrop. Underneath the fairytales and movies, I began to see reality in a new perspective. The people around you and the world you see; they all change. Suddenly, you are stuck and don’t know what to do. Who can save me? Who can – help me save myself? Well, Diana Prince did and she was ready to tell her story to the world. Yes – my latest review is on the recent release of Wonder Woman, which has taken the film world by storm. But did this film had a place in my heart? Before I seen the film, I saw the trailer and had mixed hopes. When it came to it’s release, however, a lot of my friends suggested that I should see it. And I did. If I didn’t see Wonder Woman, I would have regretted it. It was a masterpiece; and perfect for everybody. Especially girls. Diana grew up in the hidden island of Themyscira, under the protection of her mother, Queen of the Amazons. But when a World War One pilot crashes on the island and reveals a plan to destroy the world, Diana leaves Themyscira with her new friend, Captain Steve Trevor to uncover the mystery of this plan and take down the culprit – Zesus’ formal enemy Aries. 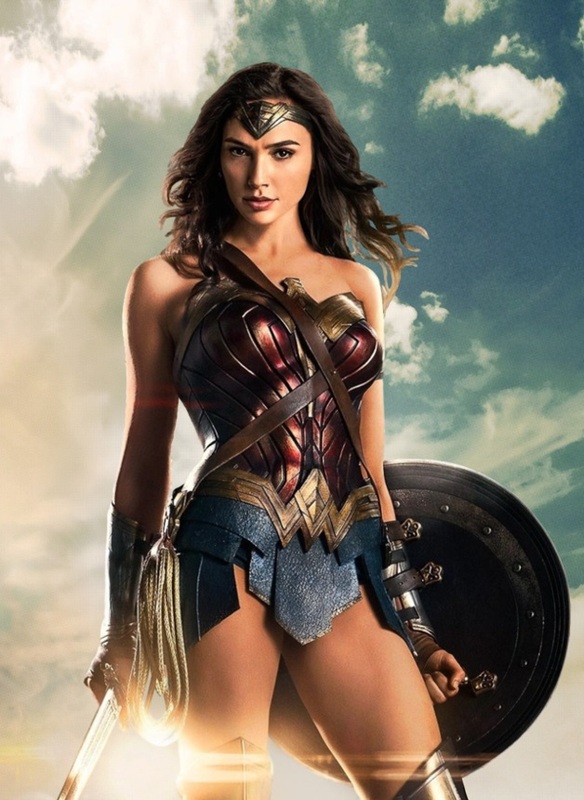 I love the concept of girl power in the early twentieth century; not a lot of films focus on independence for women – without the man fighting for them – and Wonder Woman focuses touches on the subject extremely well. Most Dc films that have been filmed have been centred on male superheroes in the present day and they didn’t do well. Why? In my opinion, these films are the same. We’ve seen them before: stereotypical plot lines with no original material. Wonder Woman is different. Why? Well – it has everything. It’s more than a super hero movie. It’s a connection to reality and imagination, teaching the audience that life is more than saving the world. It’s about who we are. As for Chris Pine, his portrayal as Steve Trevor is very comedic and sympathetic. His timing is spot on, making his funniest scenes memorable. I cried when he said goodbye to Diana and took his life to save everybody – including the world he cares about. David Thewlis (or our Professor Lupin) is a top notch Villian. Despite the “liar is revealed” cliché, I thought he delivered a marvellous performance. Lucy Davis is a great comedic actress as well. She’s got a full career ahead of her. There is one disadvantage I have of this movie and that was Elena Anaya’s portrayal as Doctors Poison. Don’t get me wrong, she was amazing. I felt that the character didn’t have a strong background story. It just didn’t make sense. I don’t have anything to say on the background, costumes or props. I don’t know why but I guess it’s a mystery. Wonder Woman is a treasure to the movie industry. No wonder why Wikipedia said it’s currently the eighth highest-grossing film this year. However, it should be higher!!!!!!!! Although I’m a screaming fan for Wonder Woman, I would like to round off this review with a serious conclusion. Not many films have the capacity to open up about the truth. With the events we are facing in the world right now, I believe that we need love and kindness. More than ever. Wonder Woman is a must-see for everyone. Not just Dc comic fans. It’s not outstanding as the Beauty and the Beast live action remake but it’s not bad either. It’s a strong film with a great storyline and amazing characters. If you haven’t seen it, I beg you to watch it. If you have seen it, what do you think of it? And who is your favourite DC character? That’s all for now. Until next time. ​Welcome to another month of YouTube International Interviews. Today, we’ll be interviewing It’s Lucee. 1)	How did ‘ItsLucee’ come to be? What inspired you to start? My channel was originally a collab channel with my old friend Becky. It came under the name TwoMindsThinkAlike due to the simple reason as best friends it was common we would say things at the same time. However, as the channel became my own I felt it necessary to rename and move on. My nickname is Luce and therefore wanted to incorporate that into my channel name. It was originally going to be ‘ItsLuce’ but there was a channel with a similar name and I wanted it to be different. By adding the extra ‘e’ it also sounds like Lucy. Many british youtubers inspired me to start, PointlessBlog and Zoella are some examples. When I was bored during the summer of 2013 I would watch youtube and so I wanted to be creative and make my own videos. 2)	What made you decide to set up ‘ItsLucee’? I feel this has mainly been answered in question one but it was all about creativity. I’ve always been into creating things from a young age and so wanted to try a new platform. 3)	Did this experience have a positive or a negative impact on you? Youtube has mainly been positive. The amount of confidence I have built from talking to a camera has really shocked me, I never in a million years thought youtube would build up my confidence because at the time it was just for the pure fun of it. Of course along with creating content you get the negative side of having to look at the analytics and were the good and bad are. I am sometimes put off from making videos when the amount of views is lower than expected. Even something as simple as a thumbs down can put me down if on that day I am not in a positive frame of mind. 4)	Do you prefer individual or collaboration filming? I love to film on my own, it’s when I am most creative. Talking to the camera is awkward but if I am filming a ‘cinematic video’ I guess you could call them then I like to be on my own creating content. Collabs are always fun, although I have only done a few. It is nice to sit in front of a camera with someone else sometimes. 5)	The biggest challenge you’ve ever faced? I presume this is through youtube, challenges occur daily when on the youtube platform but non really big enough to talk about. I am only a small youtuber so don’t expect to get big challenges yet, but I guess editing can sometimes be a challenge when something goes wrong or the video doesn’t export. 6)	Any favourite videos of your own? I love the short film type videos I have created, ones with memories. It’s the videos that you can look back on and really smile at what happened that day that make for my favourite videos. I must say however one of my favourites isn’t even uploaded at the point of writing this. It’s a cinematic type video about going to the woods but it just reminds me of a day with my grandma, one of my favourite people. It’s due to be uploaded soon and I just hope it’s a video everyone loves as much as I do. 7)	Inspiration for your channel? There is a quote that has always stuck with me ‘Those who are afraid to fall, never fly.’ It’s inspired me to try new things in order to fulfil life. Therefore, a youtube channel was something new to try and so I went ahead and made one. 8)	Who are your favourite youtubers? I have always loved family vloggers but currently ‘The Dale Tribe’ are my favourite family! One of their daughters; Aspen suffers from Type 1 diabetes and so their vlogs are very close to home being that my mum is also a type 1 diabetic, their family are great and definitely a family to watch! I have loved Roman Atwood’s videos for years now and he is still a favourite of mine. His slogan ‘Smile More’ is something I have learnt to live by. Another youtuber who I like is actually quite a small Youtuber. His name is Joe Maw, some may know him as an actor in the CBBC program The Dumping Ground. His vlogs are inspired by Casey Neistat (Another youtuber I watch and love!) but they are short and sweet vlogs that I could watch for hours! 9)	What do you see yourself doing in five years time? In 5 years time I will be 21. At this age I hope to nearly be at the end of a paramedic science degree at university. That would truly be amazing. The youtube channel I hope to have a few thousand, a small community. I have a image in my head of vlogging my progress through university so I can look back at them to see the progression. A lot of youtubers nowadays set out to earn money but that simply isn’t the case for me. I don’t plan for youtube to be a career so I just hope in five years that my channel has grown from the current 850 subscribers I have now. 10)	Is there any advice you would like to give anyone who is starting a channel of their own? Answers from Lucy Smith aka ItsLucee on youtube. I upload every Saturday and throughout holidays sometimes upload on weekdays. I enjoy reading comments on my videos as it really helps me decide on steps to take to pursue my channel. I would like to say thank you to Sez for allowing me to answer these questions for her blog, it is a wonderful idea of hers! It’s hard to believe this. But five months ago, I started my YouTube channel. In total, I have around ten videos, over seventy subscribers and about 180 views (based on one of my videos). I have been on an amazing journey so far; but I’m feeling that I’m not giving my best. Language Problem – As well as being on the Autistic spectrum, I have serve Language Problems which have affected my whole life. This means that I misunderstand social situations like political matters, or what people think about me before getting on the wrong end of the stick. E.g., when I say, “I’m beautiful in every single way” instead of “I have to be honest with myself. I’m not prefect on the outside, but I feel that I’m beautiful within”. Viewers want short, snappy dialogue – which I can understand – but, they don’t want someone who is too big-headed. It’s hard to keep everyone happy; sometimes, it can be hard to make yourself happy with the work you do. Which brings me to my next point. Internet Bullying – They say that everyone has a fear; it’s no big surprise that the twelfth biggest fear is failure (according to The Awesome Daily). And failure can be the cause of negative comments. I’ve had to deal with them and it has not been easy. But receiving a comment from someone behind the screen can make it a lot worse. When it comes down to this, most YouTubers’ would ignore and carry on. However, the words people say can hurt, whither on or off-screen. So, I guess it’s a Win vs. No Win situation that’ ll repeat itself from time to time. Not Being Self-Critical About Myself – This is the biggest point that I do not take really seriously. Like with the Language problem, I jump into conclusions, without looking at them properly. And with this, my family have said not to upload videos as I’m rushing into things. But if I don’t see them on my channel, uploaded and ready to be seen, how would I improve my videos? It can take time, but are there other ways to do this? Editing – It’s a problem for my family. Every time I prepare my videos, I have comments about the edits: that they make them sick. They don’t like how to shorten my videos to make them less than ten minutes long (i.e., when the clips jump continuously). Instead, my family have decided that I should record and run the film throughout, with no cuts (which I know can take a long time). I’ve had experiences, where they think I’ve made no mistakes. On the other side, I don’t think I’m prefect. But to be fair, what makes a prefect YouTuber? Multi-Tasking – I do all the time; work, while listening to music/watch other YouTube videos. I really need to stop but it can be addictive. It’s hard for me to open up about life behind the screen, even in front of my family (especially since we’re very close). I do want to continue my channel: it’s my favourite pastime. However, I need patience, preparation and time. Sure, I’ll be unsure whither, or not to upload a latest video after editing it, panic about the judgements everyone makes or not being happy about myself. But, I will do my best. Well, that’s all I have to say for this post. What do you think? Do you struggle with YouTube videos, blog posts, or anything else? And how to you/plan to approach them? I thought it would be nice to provide a little information structure for those that are new to DBDO as we have added hundreds of new followers and readers to the blog in the last couple of weeks AND my page strategy has changed a lot since December. What is Dream Big, Dream Often All About? I focus our conversations around 4 basic topics, all of which have to do with personal development: living a healthy lifestyle, living an organized/goal oriented life, living debt-free and living a life of charity. I call these the 4 Pillars of Successful Living. I not only espouse these, I live them. I focused on these 4 because my research revealed that these are the 4 basic areas that were common among people who considered themselves unsuccessful or under-achieving. Trust is one of the most important parts of a relationship. It is difficult for one person to be smitten by another person if he or she cannot trust in the individual anymore. Trust is a difficult element to repair. Therefore, partners should try their hardest not to cheat or lie to one another.